5. Electrochemical conversion of carbon dioxide to carbon monoxide using nanomaterials based cathodic systems"
Applications of Nanomaterials: Advances and Key Technologies discusses the latest advancements in the synthesis of various types of nanomaterials. The book's main objective is to provide a comprehensive review regarding the latest advances in synthesis protocols that includes up-to-date data records on the synthesis of all kinds of inorganic nanostructures using various physical and chemical methods. 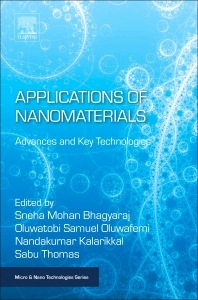 The synthesis of all important nanomaterials, such as carbon nanostructures, Core-shell Quantum dots, Metal and metal oxide nanostructures, Nanoferrites, polymer nanostructures, nanofibers, and smart nanomaterials are discussed, making this a one-stop reference resource on research accomplishments in this area. Leading researchers from industry, academia, government and private research institutions across the globe have contributed to the book. Academics, researchers, scientists, engineers and students working in the field of polymer nanocomposites will benefit from its solutions for material problems. Dr Sneha Mohan is currently working as Research Associate in Centre for Nanomaterials Science Research, University of Johannesburg, Johannesburg, South Africa . She did her PhD in Chemistry with specialization in Nanomaterials from Cape Peninsula University of technology together with International and Interuniversity centre for Nanoscience and Nanotechnology, Mahatma Gandhi University, Kottayam, India. She has more than 15 international publications and 3 book chapters in her credit. She has presented her work in various international conferences and national conferences. Her research interest includes synthesis and applications of various nanomaterials and composites including sensing and catalytic activity. Prof Oluwatobi S Oluwafemi is an NRF rated researcher and actively involved in research in the area of nanotechnology. He is a Professor at the Department of Applied Chemistry, University of Johannesburg, Doornfontein Campus, South Africa. He has published many papers in internationally recognized journals and has presented at several professional meetings both local and internationally. He is a fellow of many professional bodies, a reviewer for many international journals, and has received many awards for his excellent work in material research both local and international. His current research interests include green synthesis and application of nanomaterials in medicine, water treatment and fabrication of device.